Welcome to today's edition of Nerd Alert, where we have all the quirky, nerdy news that you crave in one convenient spot. What do we have in store for you on this wonderful Wednesday? Learn how to make your own version of Katniss' bow from The Hunger Games, a look at movies you didn't know were based on true stories and we have a supercut of sports movie speeches. But wait, there's more! Star Wars: Episode IV - A New Hope gets an honest trailer and watch a remix of The Hunger Games, envisioned as a 90s action movie! Sit back, relax and check out all that today's Nerd Alert has to offer. 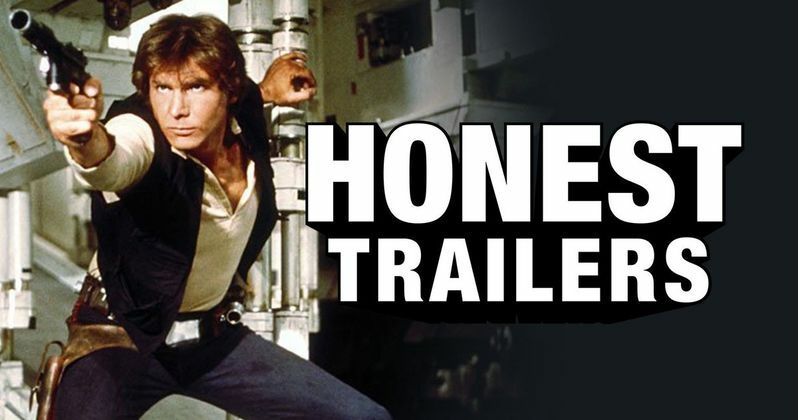 Earlier this month, the Screen Junkies team skewered Star Wars: The Force Awakens with an Honest Trailer. Today they're going back to the franchise's roots by breaking down the 1977 classic that started it all, Star Wars: Episode IV - A New Hope. This six-minute trailer highlights some of the plot holes, showcases early footage with Darth Vader's original voice, and much more. It seems likely that we'll be getting Honest Trailers for the remaining movies leading up to Star Wars: The Force Awakens, so stay tuned. The Hunger Games franchise comes to an end this weekend with The Hunger Games: Mockingjay Part 2, so Vulture has put together an epic remix that re-imagines this entire franchise, if it was launched in 1992. This 90-second trailer uses narration from the late Don LaFontaine, and cutting edge 1990s graphics. Vulture's remix shows us how ridiculous this dystopian world may have looked, if it were released 20 years ago. Every other week, the folks at Awe.Me's Man at Arms: Reforged create iconic weapons from movies and video games. With The Hunger Games mania sweeping the nation, these expert weapon makers have decided to make Katniss' bow from The Hunger Games: Catching Fire. While this isn't exactly a DIY project, it's still fascinating to see how this bow is created from scratch. Screen Rant has a video breakdown of 10 movies that you may not have known were based on true stories. You may or may not have known that Rocky is based on the true story of Muhammad Ali's fight with little-known Chuck Wepner, and Raiders of the Lost Ark is based on the life of real-life explorer Hiram Bingham. In practically every sports movie, without fail, there is a rousing speech by a determined head coach that inspires his or her players to take their game to the next level. In case you're in need of some inspiration today, Burger Fiction has assembled a three-minute supercut featuring speeches from a diverse array of sports movies, such as Any Given Sunday, Miracle, Remember the Titans and even the original The Bad News Bears. The folks at Wired have a new video series where they construct various Star Wars Lego ships, and then destroy them, with super slow-motion cameras capturing the destruction. Their latest video features the 1,329-piece Millennium Falcon, which took four hours to build, and just 0.2 seconds to destroy, by simply dropping it on a wooden platform. The super slo-mo cameras show what happen to some of these mini-figures during the destruction, and it's quite fascinating to watch. Anyone who has grown up with Legos knows the pain of stepping on a mini-figure or a block, and now LEGO has done something about it. The company has created their own official slippers, which will protect your feet in a LEGO-heavy area. What's even better is these slippers will be randomly given away for free to random users who create a wish list on the https://wishlist.lego.com/fr-fr/?domainredir=lego.fr|Lego France website. That wraps it up for today's Nerd Alert. Do you have any suggestions for future Nerd Alert columns? Hit us up on Twitter @MovieWeb and send us your suggestions, and it may even make it in the next edition. Check back on Friday for the latest installment of Nerd Alert.